Well we are still in Linn House, after returning from Glenburgie Distillery we all headed for our rooms to be met with our Highland outfits and Kilts or Sashes for the Ladies. The plan was for us all to freshen up and don our outfits and then head down to the grand lounge for a dram prior to dinner. Everyone was on time and all in their splendid outfits, a great sight to behold, some of the Sassenachs had a little bother with their kilts etc., but we from the north quickly sorted them out, everyone now looked great. A grand old mahogany corner drinks cabinet was opened, inside a collection of crystal glasses and a great selection from the Chivas Brothers store, we were all offered a dram, Nicola enjoyed an aged Glenlivet and Jim could not go past the Aberlour A’bunadh and this is still Jim’s favourite to date, lovely dram. 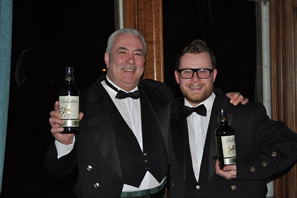 Jim then decided to have a taste of the Scapa 16 Year Old, the Whisky Boys only other venture into this distillery was a 14 year old Old Malt Cask bottling from Douglas Laing. Jim found honey and heather notes, maybe the slightest hint of smoke then we have a long finish with a peppery tingle on the tongue, excellent dram. 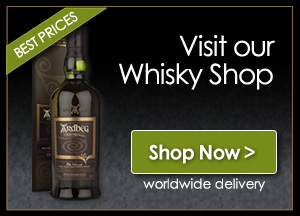 Jim will need to remind Nicola that we should get a bottle and organise a full tasting on this. We all sat around, drams in hand, guests and hosts together enjoying the atmosphere and the chat, what a way to meet new friends and enjoy some off the best whisky that Scotland can produce. Prior to going through for dinner we all involved in a photo shoot, individual photo’s and group photos were taken, these all will be on or Gallery very soon. 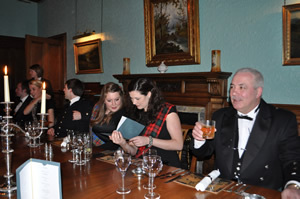 Very quickly we were invited into the grand dinning room and we all took our seats, our additional hosts were Sandy Hyslop and Alan Winchester, (The Glenlivet Master Distiller). No sooner sat down than the chat and experiences of the day were being discussed. Dinner was accompanied with two great wines, a Reserve Riesling 2007 and a beautiful Rioja Crianza 2006, our first course was a delightfully smooth and light Smoked Salmon Terrine, but what happened next surprised us all. 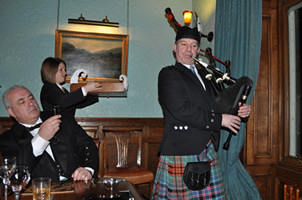 Enter a piper and a full Haggis, which was marched round the dinning room and placed at the head of the table, now that was not the finish, up came Alex Robertson who proceeded to give the full address to the Haggis, we had never heard it said with such passion and belief. As you can guess the second course was Haggis, Neeps an Tatties, superb. The main course followed, Fillet of Scotch Beef, Fondant Potato, Red Wine Jus and Garden Vegetables with the sweet be Hot Valhrona Chocolate Fondant, then we all sat back and enjoyed the Coffee and Sweets, still sipping the remainder of our earlier drams. Could the night get any better, well guess what, it did. We all headed back into the lounge to find facing us was the 14 piece Strathspey Fiddlers, their performances, which included Fiddle, Piano, Guitar, Pipes, Singing and Dance were first class, the toes were tapping the drams were enjoyed and this certainly was a big part of the nights delights. So it is now a little before 11 pm, and most of us have been up since before 5 am this morning and we thought that this must be time to have a final dram and retire for the evening, but, yes, you are right, we were wrong, Alex asked us all to head out of Linn House and join him and the other hosts (Andy, Alan, Courtney, Grace and Kaye). Now from the grandeur of Linn House we reached a small door in what looked like a hedge row, this was opened and everything that was Linn House was now turned on it’s head. This Garden Bar was so modern, to the right when you entered was a fully stocked Chivas Brothers Bar, to it’s left was a Wurlitzer Jukebox, to it’s left was a smashing relaxing seating area, but it it’s left was a POOL TABLE how very unexpected. 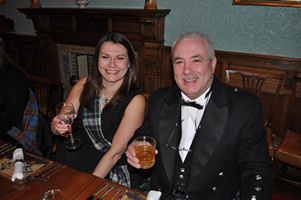 We all enjoyed the drams that were in the bar, Nicola found it difficult to not take her beloved Glenlivet but did enjoy a wee 16 Year Old Longmorn, Jim had his enjoyable Aberlour and a very fine Strathisla, what hospitality. The drams were flowing the music was loud the chat was never-ending, it is reported that Alex, Sandy and Alan were betting one or two of Chivas’s Distilleries on a frame of pool, we also heard that they lost Glenlivet but were able to win it back, so all is well in the world. 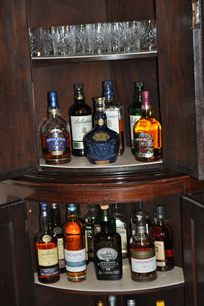 It is now 1am or later and we head back to the lounge for our final drams and chat. Joel and Neil from Caskstrength gave us a little musical interlude, Neil played the piano and the guitar and Joel was less than adequate on the dining room’s gong. The evening ended well, everyone was warm and happy, having enjoyed a fabulous day. That just leaves us to tell you all about tomorrow, that will be in part 3. good night, sleep tight.